Something is wrong with people in this country. There seems to be a distinct lack of understanding of the realities of being sick. You and Yours on Radio 4 today discussed “The hardest hit” march which will happen tomorrow. The opinion of most of the callers seemed to be that there are too many disabled people, that disabled people shouldn’t ever spend money on alcohol or going to the pub, or on driving, but should stay in their homes waiting for death. Never mind that sick people have worked and paid tax and national insurance. Never mind that with help, they might work again. Opinion amongst You and Yours callers seems to have followed the rhetoric of the government and the tabloids and turned against the sick and disabled. On of the callers quoted that fact that 36% of applicants for ESA drop out before their medical assessment and asked what that tells us. I know what it tells me. It tells me that the process of applying for benefits is obscenely difficult and stressful for genuinely disabled people. That a 20 page ESA50 form demanding that you write out your symptoms and problems over and over again detailing how it affects you is nearly impossible to face. That the likelihood of being judged fit for work by ATOS and their computer system despite obviously not being so is extremely high and puts people off even trying. That the appeals process is long, tedious, draining, and can make an illness many times more difficult to deal with, even though so many people eventually win on appeal. And don’t forget that some illnesses get better and circumstances change! The attitude of government of all varieties of party is highly damaging. The last government introduced Employment Support Allowance to replace Incapacity Benefit. Where IB only varied based on length of illness, ESA has two groups, the support Group, and the work related activity group. People on the work related activity group are expected to find work within their limits, and eventually to move to Job Seekers Allowance if they do not. Claimants must undergo a Work Capability Assesment which will decide which group they go in, or declare them fit for work and move them to Job Seekers Allowance. The WCA test is administered by private company ATOS and is largely computer based. Staff at ATOS are given a short time to ask the benefit claimant questions and click keywords on the computer depending on their answer. The claimant is asked to make a number of physical movements, and only their completion or failure is recorded, not the difficulty in performing the task or the effects afterwards. As a result many people are declared fit for work when they are clearly not. A high percentage of those people go on to appeal and overturn that decision. Of course many people won’t appeal, but 40% do, and of those, 70% are found not fit to work after all. Unfortunately, it’s not unheard of for people to die while waiting. The problem I have with Employment Support Allowance is that it changes the whole meaning of the benefit from “We will look after you” to “Go and get a job.” To the people claiming this, it is a huge challenge. People dealing with overwhelming illness, disability or mental health problems may well want to work eventually, but first they need to get away from these pressures and recover. Even under incapacity benefit there was the notion of “permitted work” where people were able to look for work that might ease them back in to the workforce or simply be therapeutic for them. This was sensible. Starting out with the idea that a sick person should simply find an easier job is not. It gets worse though; in my doctor’s waiting room I saw this poster. 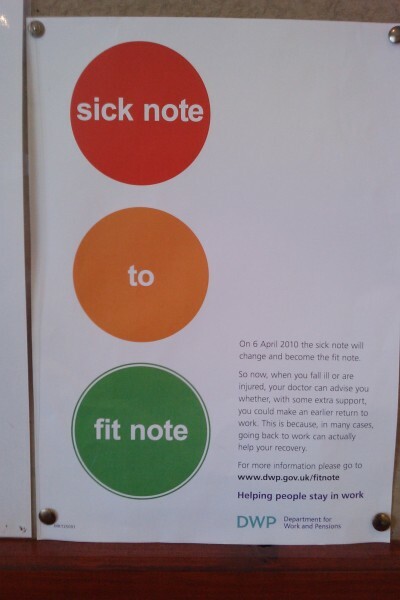 The gist is that the government has changed the name of a sick note to a “fit note” because people shouldn’t ever be signed off work to recover, they should simply make accommodations for their illness and carry on. Or get an easier job. I think everyone realises that in reality sometimes people simply need rest to recover before they start work again. Many people receiving benefits have worked and paid tax in the past, and with the right support may recover enough to find work again, but this vilifying of them by the government and the tabloids will not achieve that. When government ministers quote fictional and misleading figures about benefit claimants, it is clear that they do not aim to help those people. Just remember, before the Nazi’s started on the Jews, they went after the disabled people, who were the first victims of Zyklon B gas. The motto over the gates of Nazi concentration camps was “Arbeit Macht Frei” or “Work makes you free.” Our current society seems to see people as human only if they fit a certain ideal in the way that they contribute to society. The sick and the disabled do contribute to society, but not necessarily through paid employment. To the government, sick people do not contribute and are therefore less human. How far does this go? Society teeters on the edge between treating people as human beings each worth something or simply writing off those that are not useful to the rich and powerful. How far is our current society willing to go in writing off the sick and disabled? great post, i totally agree with everything you say here. i have had the letter saying to expect the ESA 50 form any day now and i am feeling sick with worry. i suffer from severe cyclical depression and luckily been fine for a good 7 years but given the down times i have had recently i wonder how far it will go with the stress and worry? i forgot to mention~i read, its somewhere on the Disability Alliance site, that if a movement causes pain then the person is to say they cannot do it, because as you say, they do not take into consideration problems in performing tasks. they dont consider pain cased by repetitive actions. like me for example~i can maybe, on a good day, type for a few minutes before pain starts (as i sit here doing this the pain is slowly moving up my arm to my neck) or i will get a mug out a cupboard, that hurts but at times its get a mug out or not not have a drink :S…you get the idea! i think it even went to court in one case and atos were overruled because they did not take into account the pain of doing something over. I’d never heard of values analysis before. But it’s interesting. The suggestion is that the very people you need to convince are turned off by your arguments because they have an opposing world view – whereas the people surrounding you share the same world view as you, and naturally agree with your arguments. So everyone _you_ know can see quite obviously that you’re right, and you keep making these entirely reasonable arguments that appear to sway everyone you know – meanwhile a non-representative sample of the Great British Public on You and Yours seems to take entirely the opposite view. Conclusion: it’s not just about getting your message across. It’s about portraying your position in a way that appeals to those who don’t already naturally agree with you. Talking about it in a way that _you_ think would convince any reasonable person is absolute the wrong thing to do. You need to get into the heads of those who remain unconvinced. I can’t quite get my head around how you would do this, but then, it’s not my job. However, if that article is correct (it discusses it WRT the AV referendum, but I think the argument is even more relevant and important in the current context) then the absolute best thing that disability campaigners could do would be to hire someone who gets this, and to get them talking to the press. P.S. another observation in that article is that the UK is moving to the right, entrenching a world view in people’s minds that could be seen as unhelpful. It’s a chilling thought that we could keep moving right-wards until we’re like America. Thank you for speaking the truth. It is high time someone did. Did you ever consider running in an election?